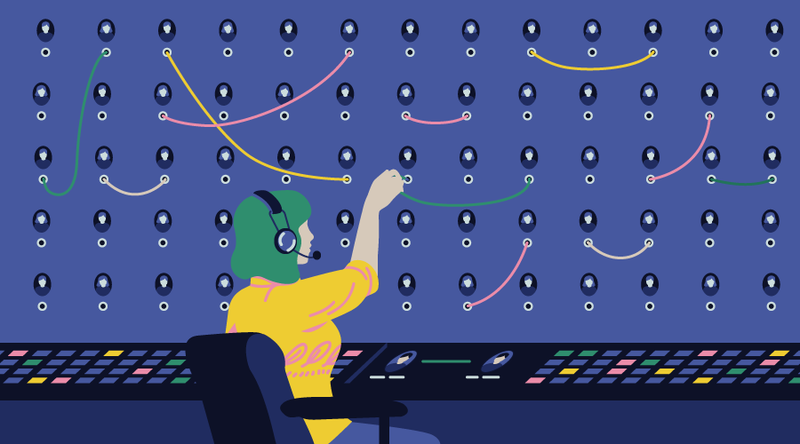 The popular way of building a server-side API is to use a library like Express or Restify. These libraries make creating RESTful routes easy. The problem with these libraries is that we’ll find ourselves writing a ton of repeating code. We’ll also need to write code for authorization and other middleware logic. To escape this dilemma, we can use a framework like Loopback or Feathers to help us generate an API. FeathersJS, on the other hand, is much easier to get started with and has realtime support built-in. Quite recently, the Auk version was released (because Feathers is so modular, they use bird names for version names) which introduced a vast number of changes and improvements in a number of areas. According to a post they published on their blog, they are now the 4th most popular real-time web framework. It has excellent documentation, and they’ve covered pretty much any area we can think of on building a real-time API. What makes Feathers amazing is its simplicity. The entire framework is modular and we only need to install the features we need. Feathers itself is a thin wrapper built on top of Express, where they’ve added new features — services and hooks. Feathers also allows us to effortlessly send and receive data over WebSockets. We’e going to build a CRUD contact manager application using React, Redux, Feathers and MongoDB. You can take a look at the completed project here. Open a new terminal and inside the backend directory, execute yarn test. You should have all the tests running successfully. Go ahead and execute yarn start to start the backend server. Once the server has finished starting it should print the line: 'Feathers application started on localhost:3030'. If you’re new to Postman, check out this tutorial. When you hit the SEND button, you should get your data back as the response along with three additional fields — _id, createdAt and updatedAt. 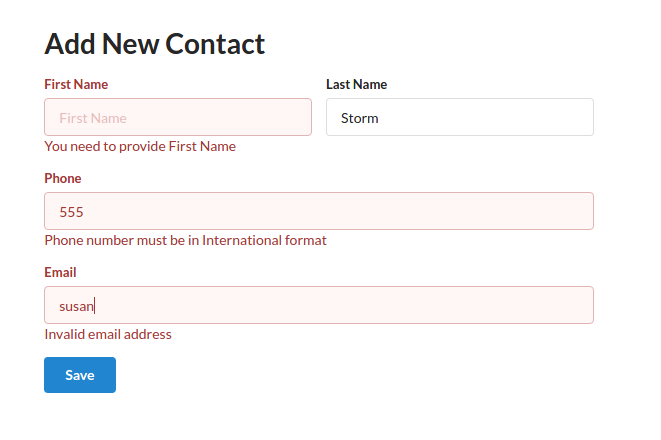 For the contact-form component, it needs to be smart, since it’s required to manage its own state, specifically form fields. For now, we’ll place this placeholder code. Finally, update the index.js file with this code where we import semantic-ui CSS for styling and BrowserRouter for using the HTML5 history API that keeps our app in sync with the URL. Phew! That’s a whole bunch of packages for setting up Redux. I assume you are already familiar with Redux if you’re reading this tutorial. Redux-thunk allows writing action creators as async functions while redux-promise-middleware reduces some Redux boilerplate code for us by handling dispatching of pending, fulfilled, and rejected actions on our behalf. Feathers does include a light-weight client package that helps communicate with the API, but it’s also really easy to use other client packages. For this tutorial, we’ll use the Axios HTTP client. The redux-devtools-extension an amazing tool that keeps track of dispatched actions and state changes. You’ll need to install its chrome extension for it to work. Define contact-actions.js with the following code. For now, we’ll fetch data from the contacts-data.js file. In contact-reducer.js, let’s write our handler for the 'FETCH_CONTACT' action. We’ll store the contacts data in an array called 'contacts'. In reducers/index.js, we’ll combine all reducers here for easy export to our Redux store. In store.js, we’ll import the necessary dependencies to construct our Redux store. 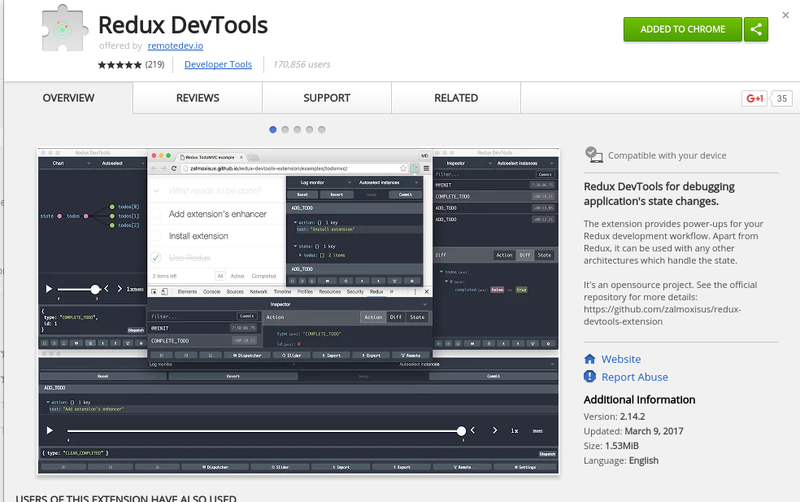 We’ll also set up the redux-devtools-extension here to enable us to monitor the Redux store using the Chrome extension. Open index.js and update the render method where we inject the store using Redux’s Provider class. Let’s run yarn start to make sure everything is running so far. We’ve made the contacts array in store and the fetchContacts function available to ContactListPage component via this.props variable. We can now pass the contacts array down to the ContactList component. For now, let’s update the code such that we can display a list of contacts. Now that we know the Redux store is properly linked up with the React components, we can now make a real fetch request to the database and use the data populate our contact list page. There are several ways to do this, but the way I’ll show is surprisingly simple. First, we need to configure an Axios client that can connect to the back-end server. Next, we’ll update the contact-actions.js code to fetch contacts from the database via a GET request using the Axios client. Update contact-reducer.js as well since the action and the payload being dispatched is now different. After saving, refresh your browser, and ensure the back-end server is running at localhost:3030. The contact list page should now be displaying data from the database. 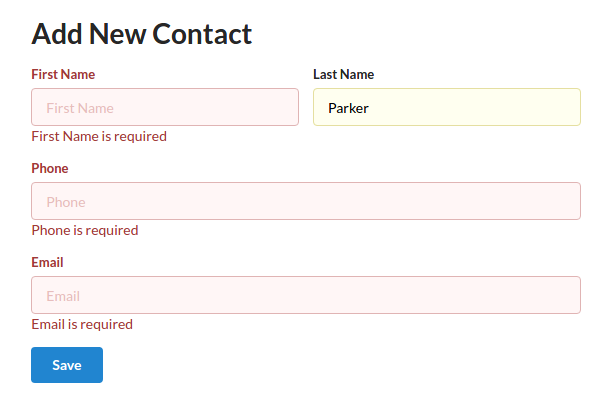 Next, let’s look at how to add new contacts, and to do that we need forms. At first, building a form looks quite easy. But when we start thinking about client-side validation and controlling when errors should be displayed, it becomes tricky. In addition, the back-end server does its own validation, which we also need to display its errors on the form. Rather than implement all the form functionality ourselves, we’ll enlist the help of a library called Redux-Form. We’ll also use a nifty package called Classnames that will help us highlight fields with validation errors. We can now start the server after the packages have finished installing. Take the time to examine the code; there’s a lot going on in there. See the reference guide to understand how redux-form works. Also, take a look at semantic-ui-react documentation and read about its elements to understand how they are used in this context. Next, we’ll define the actions necessary for adding a new contact to the database. The first action will provide a new contact object to the Redux form. While the second action will post the contact data to the API server. As you can see, server-side validation prevents us from saving an incomplete contact. We’re using the SubmissionError class to pass this.props.errors to the form, just in case you’re wondering. Now, finish filling in the form completely. After clicking save, we should be directed to the list page. After saving the file, go back to the browser and try adding invalid data. This time, the client side validation blocks submitting of data to the server. Now, go ahead and input valid data. We should have at least three new contacts by now. Now that we can add new contacts, let’s see how we can update existing contacts. We’ll start with the contact-actions.js file, where we need to define two actions — one for fetching a single contact, and another for updating the contact. Let’s add the following cases to contact-reducer to update state when a contact is being fetched from the database and when it’s being updated. Next, let’s pass the new fetch and save actions to the contact-form-page.js. We’ll also change the componentDidMount() and submit() logic to handle both create and update scenarios. Be sure to update each section of code as indicated below. We’ll enable contact-form to asynchronously receive data from the fetchContact() action. To populate a Redux Form, we use its initialize function that’s been made available to us via the props. We’ll also update the page title with a script to reflect whether we are editing or adding new a contact. Now, let’s convert the Edit button in contact-card.js to a link that will direct the user to the form. Once the list page has finished refreshing, choose any contact and hit the Edit button. Finish making your changes and hit save. By now, your application should be able to allow users to add new contacts and update existing ones. Let’s now look at the final CRUD operation: delete. This one is much simpler to code. We start at the contact-actions.js file. By now, you should have gotten the drill. Define a case for the deleteContact() action in contact-reducer.js. 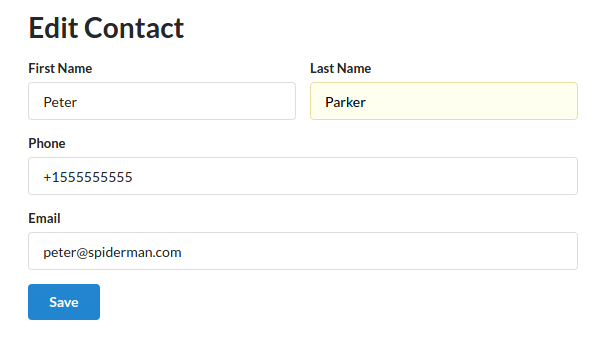 Next, we import the deleteContact() action to contact-list-page.js and pass it to the ContactList component. Finally, we update Delete button in ContactCard to execute the deleteContact() action, via the onClick attribute. Wait for the browser to refresh, then try to delete one or more contacts. The delete button should work as expected. As a challenge, try to modify the delete button’s onClick handler so that it asks the user to confirm or cancel the delete action. Paste your solution in the comments below. A Flux-based framework, such as Redux, allows us to build large complex projects that are easy to manage. If you don’t like the verbose code that Redux requires you to write, then you could also look at Mobx as an alternative. At least I hope you now have a good impression of FeathersJS. With little effort, we were able to generate a database API with only a few commands and a bit of coding. Although we have only scratched the surface in exploring its capabilities, you will at least agree with me that it is a robust solution for creating APIs. This article was peer reviewed by Marshall Thompson and Sebastian Seitz. Thanks to all of SitePoint’s peer reviewers for making SitePoint content the best it can be!